Barron's. 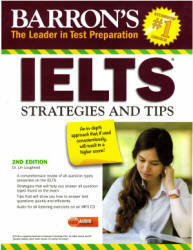 IELTS Strategies and Tips. Barron's: 2016, 2nd ed., 296p. Getting a high score on the IELTS begins with a plan. This book offers test-takers a range of strategies for choosing the best methods for answering questions, along with useful tips that help them make choices quickly and efficiently. Together, these tips and strategies will give prospective test-takers a plan for success on each module of the exam--Listening, Reading, Writing, and Speaking. Practice questions with fully explained answers and an MP3 CD add to the benefits of this unique test guide. A strategy is a plan. A tip is a suggestion. A strategy tells you how to answer a question. A tip will help you answer it quickly. The IELTS exam is a two-hour exam with four parts and many types of questions in each part. You need to have a plan before you start to answer these questions. You need to have a strategy. There are many possible ways to try to answer a question; you must find the best strategy for you. The tips in this book will help you make efficient choices. The tips will make you a faster, more proficient test taker. A good test strategy combined with useful tips will improve your efficiency and increase your score on the exam.